This is a walkthrough of my electric fan installation. I'm putting this up in the hopes it will save someone else a little bit of time doing this same swap. Installing electric fans saves a little bit of horsepower, cools the engine better, and most importantly (to me) frees up A TON of engine compartment space. My clutch fan went bad on me, so I thought it would be a perfect time to upgrade to some electric fans. 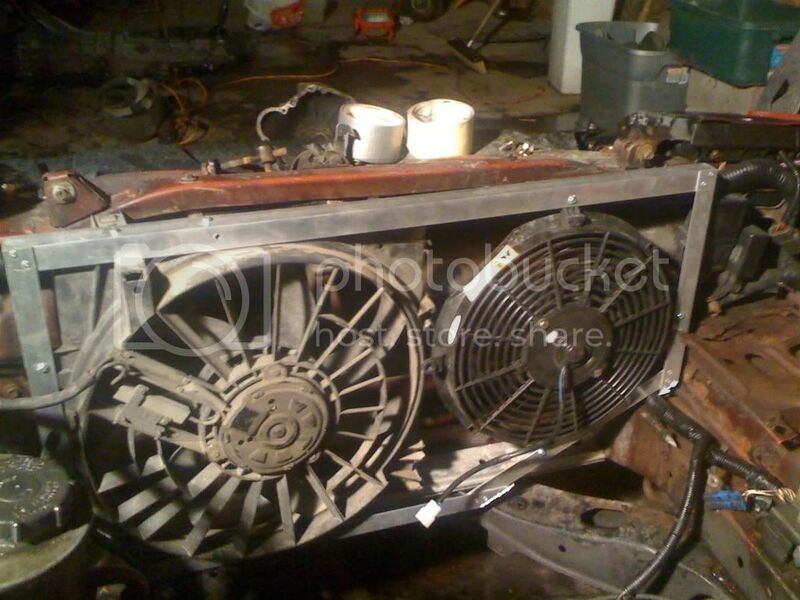 I started with reading on this site, reading about clutch VS electric fans in general, and looking at Chris' V6-s12 electric fan walk through. All were very helpful. I ended up pulling a set of fans out of a '91 Nissan Maxima, which fit with barely any modification, cost me $25, and seem to pull a very reasonable amount of air. I decided on a switch controlled fan, because thermostatic switches were prohibitively expensive ($100 for a good one, $50 for a crappy rad fin sensor from AutoZone). So these are the fans I started with. They are two separate fans that fit together. I drilled a few extra holes in the corners to support zip ties for attachment to the radiator. They haven't blown yet. Oh! That's another thing. Read up on relays, how they work, and how to wire them. I learned all about them for this project. They're a pretty sweet little electrical trick. I ended up following this wiring diagram exactly, except that I used two separate switches, instead of one 3 position switch, as the diagram shows. I couldn't find a 3 position switch, honestly--and I'm cool with two separate switches. These are the awesome retro switches I installed. I dig their look, and the nice metallic 'click' they make. I actually installed them right in the dashboard, as I couldn't figure out how to separate the top and bottom pieces of the dash. There is plenty of room behind there for a drill to do its thing, just pull off the trim piece underneath and take out the cruise cont switch so you can see what you're doing. Couldn't find a convenient place to run through the firewall, so out the side and under the hood it was. The switches draw almost no current, so 18-22 gauge wire is fine. I tapped into the radio's 12v ignition switched wire. Use a test bulb to find the right one. The light colored wire below was a replacement for shot stock speaker wiring. One of the only things that didn't quite fit with the Maxima fans was a tube coming off the power steering pump. It got dangerously close the the fans, and I was worried it would slip too far over and start getting chopped up. That would've been fun, right? No steering and an overheating engine as a combo? No thanks. I zip tied (those are the most versatile things in the toolbox, seriously) the tube to an adjacent mounting bracket to pull it away from the fan. This is the finished arrangement for the installation. 30A fuses coming off the positive post on the left (yellow wires), relays zip tied together, sealed with electrical tape, and tucked under the main wiring bundle at the front and in the top of the picture, and everything grounded to the existing ground bolt on the right side of the picture. And the final view of my complete installation. I love the extra space I get by not having that huge fan shroud and clutch fan, and it still looks almost stock. The wiring from the switches in the dash follows near the red line, under the washer/antifreeze reservoirs, around the battery, and to the relays. This may have been overkill for such a simple job. I'm thorough, what can I say (hehe), but I wish someone would have done this for me to read before I jumped into it! Thanks to Keith for his help, and to Chris @ v6-s12.com for his project pics. Again, I hope this helps! vote for sticky! thanks for the write up. I may braven my self someday to do it. Pretty much the same way I did mine. Cept I only did 1 speed. I used Infinti G20 fans but they look identical to those. also I ran my wiring through the drivers side fender and into the dash. The same way that the wiring harness goes through to the ecu. I add a electric fan. The fact is i'd like to know if we can use another 12v wire i mean on mine i take power to the battery but idle lose like 100rpm. Can we use the "load" 12v system like for headlights (more rpm when we switch on them)? Thanks, I plan on doing this when I get my motor in. Thanks for the writeup! still dont get why you would want electric fans on a KA; or other non preformance motor. the clutch fan will be just fine, and cause way less headaches if something goes wrong. have a single cam KA in your mk 2? - We only discuss Maxima fan installations on this thread, no other setups. - We keep the conversation on that subject and the fun stuff elsewhere. Also, we need to know WHAT RANGE OF YEARS of Maxima this fan came from. I decided on a switch controlled fan, because thermostatic switches were prohibitively expensive ($100 for a good one, $50 for a crappy rad fin sensor from AutoZone). I found an OE thermostatic switch/tube thingamajig from an 80's era Sentra that goes in-line on the radiator hose, cost like $10.00 with switch which still works. Makes a real clean OE looking install. Dude, household solid copper wire? The solid copper stuff will work-harden over time and break due to all the vibration. could i use a Thermo switch from any nissan and wire it inline? they are like on/off switches right? or will it fry something if i wire them without an relay? Yes they are switches, low current though, run with a relay for sure. The thermo-switch closes at a set temp. usually about 190 degrees and open at a lower temp. like 170 or so. Easy suspension tuning is in your hands. S - Tech was made so that everyone can enjoy sports driving. TEIN based these springs on original specification so that the installation is easy. Full compliance with car inspection, and great styling. Adding some more exicitement to your ride.. The highest quality brought to you at great JayDM prices. Now comes in two types to choose from. Nice install! I'm glad to see my writeup is still helping people after all this time. Incidentally, I ran my wires through the firewall via the hood-release cable opening. Just pulled a fan from the junkyard a few days ago. Little too big so i cut it down to size. What would be a good way on bolting the damn thing down? As of right now i just took rope (Or twine idk the difference) and tied it to different parts of the car.